After much anticipation, 528 Victoria Falls Guest House opened its doors in December 2018. For more than a year, builders were seen going in and out of the property as it received a complete makeover. Owners Meredith and Paul put their heart and soul into this lovely guesthouse, converting it from a ramshackle large old house into an absolute gem of a lodge, full of style and elegance. It has personality written all over it, on all three floors, with quirky designs and interesting artefacts. From the very entrance one is greeted with green serenity. 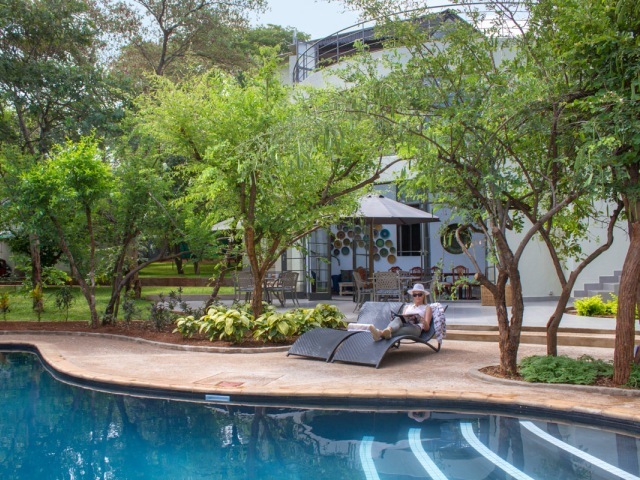 Lush gardens surround the main building, and a lovely sparkling swimming pool sits in front of the guest house. 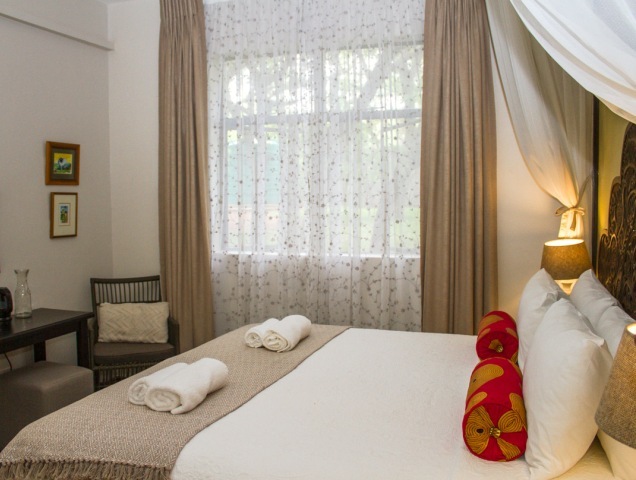 Personalised and comfortable twin and double rooms occupy the first two floors of the building, each with their own view over the gardens. There are also two triple rooms for families or groups of three. All rooms have en-suite, stylish bathrooms with bronze washbasins, and showers with hand-carved screens. Neutral and earthy-tones are blended with splashes of bright colours throughout the lodge. As you enter the house, after passing the lovely pond, a warm foyer greets you with a mixture of wall art and a curious wallpaper. The main dining area, where breakfasts are served is bright and colourful thanks to more art and the large glass windows that stretch to the high double volume ceiling. From this room, the doors open onto the patio, the garden and the swimming pool. There are lounges and patios dotted around which are perfect spots for reading, relaxing and chatting. But almost certainly one of the highlights is the "Treetop Bar" on the third floor, which has wonderful views above the tree canopy and beyond to the Zambezi River and Zambia in the distance. 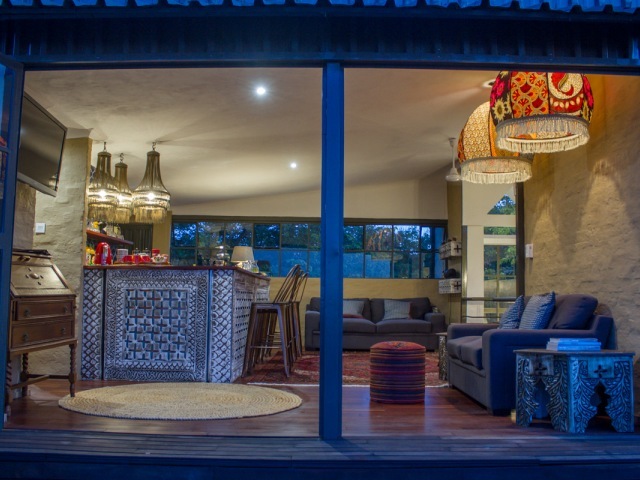 It's an ideal place for sundowners and as evening settles in, to gaze up at the endless African night sky. 528 Victoria Falls has a fresh and unique boutique lodge feel. Well thought out, in all aspects of its design and offerings. It's owners Paul and Meredith, who are onsite, will make you feel completely at home. Priced right in the middle, between the likes of Bayete Guest Lodge and the more upmarket Batonka Guest Lodge, this lodge definitely offers great value for the price it is charging. With only seven rooms, this lodge fits into its own quirky little bracket of accommodation, nothing else quite like it - owner run, small and personal, designer decor, great quality all at a very affordable price. The "Tree-Top" honesty bar is also unique, not present in any other guest lodge here. It is also an alternative to the home-stay properties when it comes to groups or large families. 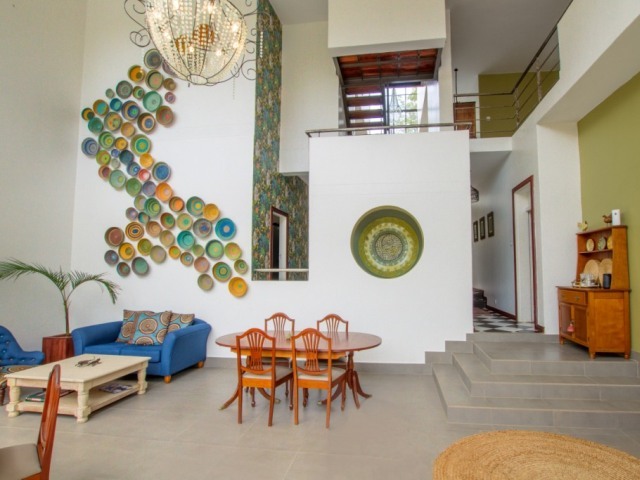 The whole house can be rented for exclusive use, at an affordable price, and can accommodate up to 16 people, which is bigger than the home-stays. Children 5 years and older are welcome. Triple rooms are available for all ages. The lodge is situated at 528 Reynard Rd. Transfers can be easily arranged from Victoria Falls, Livingstone or Kasane Airports to the guest house. Contact us for assistance.